Yesterday was a very busy day of running around! We set off a little bit before 3 pm with a list of errands. First stops, the post office and the Wine & Spirits store. We stocked up on wine for the holidays and we got to sample the Godiva Chocolate Liquor and Godiva White Chocolate Liquor - yum to both! We might have to indulge in the white chocolate for a recipe: Vanilla Bean Biscotti dipped in White Chocolate (spiked with the liquor!). Then we went over to Lowe's to look at Christmas decorations. We didn't decorate outside last year -- we were the 'boring' people on the street. Last year, the Friday after Thanksgiving, everyone on our street (there's only 6 houses) did lots of exterior holiday decorating. Not us! This year, we decided to put candles in the windows. Lowe's didn't have the candles we were looking for, but we did buy a wreath for above the fireplace (the Japanese butterfly cross-stitch looks awfully out of place there once the Christmas decorations are out!). Next up, our favorite store (HAHAHA) - WalMart. After stocking up on some items, we located the Optimus Prime Transformer and purchased it for my nephew. SP is awfully intrigued by it. I think he wants to take it out and play with it!!! We were disappointed in our Target store's holiday decor. We also took a quick trip through DFO (going out of business sale) and then went to Pool City where we found our window candoliers!!! Pool City is where we got our Christmas tree last year (my tree was too large for our living room, we needed a slimmer tree, so now we have a spare tree in case we ever want to put one up in the basement, too). Then we were off to Settlers Ridge. We browsed Learning Express looking for gift ideas for the niece/nephews and then ate dinner at Panera. I mentioned last week that Panera was having several Grand Opening specials. SP stopped by on Thursday to take advantage of the 'Buy 3 Bagels Get 3 Free' special deal so I've been enjoying asiago cheese bagels. Last night was my first time inside. It's nice and big inside. There's a big 8-10 person table for larger groups and the fireplace is near couches/comfy chairs as well as tables. We ate at a table in front of the fireplace and as we were eating, employees came around with a 'Customer Appreciation' chocolate chip cookie for each person! Dessert! 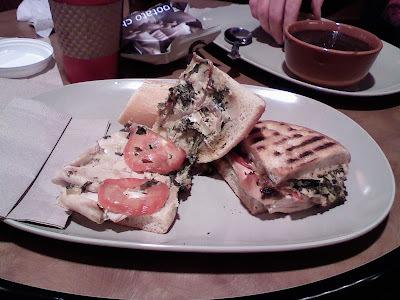 I had the Turkey-Artichoke Panini and a decaf latte. 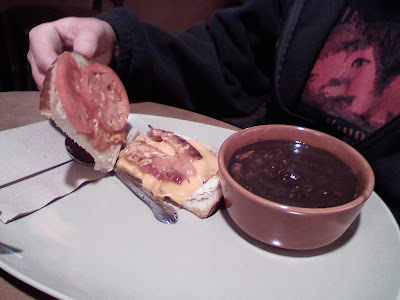 SP enjoyed a "You Pick Two' of black bean soup and Chipotle Chicken sandwich with iced tea. Again, opening special - we had a coupon for $3 off a You Pick Two! After that it was time for Giant Eagle Market District. It wasn't super crowded, but we still had several near collisions with other carts! I really like the cup holders on the carts - I still had my Panera latte and I got to enjoy it while we shopped. Sugar Cane! 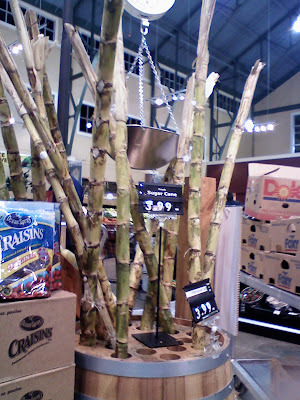 I'm not really sure how the home cook would use this sugar cane stalk, but it was neat to see it in the store. 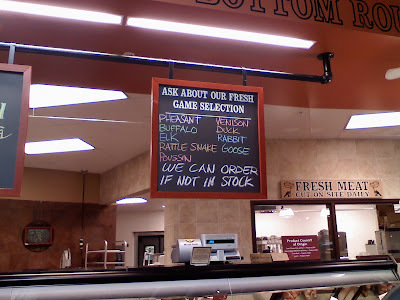 Rattlesnake, anyone? It can be special ordered! And did I mention Grand Opening specials?! Giant Eagle has mailed out many, many coupons for the new store. Our groceries rang up at $67. After all the coupons, our bill was $39!!! We got home and put everything away. SP put all the candoliers in the windows. Then we snuggled up with hot tea and Panera chocolate chip cookie and watched Flash Forward, Giada's Thanskgiving, and got sucked into watching the ends of 2 exciting college football games (Georgia's loss to KY and Oregan's 2OT win over Arizona). A busy and productive Saturday! That means today we get to lounge around and watch football all day! There's some single candles that turn on at dusk and then off during the day - those seem like a good idea and I was going to get them but then I saw the ones we bought and they reminded both of us of our childhood window decorations! Lowe's had some nice porch trees but not sure if they are battery operated.